Even though the movie Jurassic Park was ground breaking for its time, it got a lot of its facts wrong, especially with velociraptor. Velociraptors were not as large as what was shown in the movie. They were actually only about 1 meter tall and 2 meters long, most of which was tail. Adults weighed about 9-14 kilograms, looking somewhat like a turkey with a long tail. 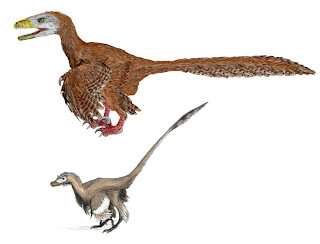 Velociraptors were similar to birds in many ways. They had feathers, hollow bones, and a wishbone. They also built nests. The more that we learn about these animals the more we see them as prehistoric birds. Fossil evidence suggests that velociraptors were solitary creatures and did not hunt in packs, as portrayed in the film. There is a famous fossil specimen of velociraptor locked in combat with protoceratops, a small horned dinosaur about the size of a sheep, but no pack of velociraptors engaging in this or any other hunt has ever been found. Velociraptors were also not found in Montana or even the United States, as the movie suggests. They have only been found in Mongolia. Another myth that I would like to dispel is that velociraptors were intelligent. Certainly not smarter than dolphins or primates, as suggested in the movie. The velociraptors in Jurassic Park were actually modeled after deinonychus, a larger cousin to velociraptor which also was feathered. Deinonychus did occasionally hunt in packs and was probably a bit more intelligent, but that is a relative term when talking about dinosaurs! Velociraptors had bird-like claws. Its middle claw was retractable and could extend out to about 8 cm for slashing and stabbing its prey. This was velociraptor’s main weapon, similar to the spurs on a rooster. Because velociraptor hunted, it was probably warm blooded. Cold blooded animals don’t usually hunt, instead preferring to wait for their prey to come to them. But the largest myth perpetrated by the movie is contained in its title. Velociraptor lived during the late Cretaceous, about 70 million years AFTER the end of the Jurassic period. Maybe Cretaceous Park just didn’t have the same ring to it.